FOUNTAIN INN, SC--(Marketwired - September 22, 2016) - AVX Corporation (NYSE: AVX), a leading manufacturer of passive components and interconnect solutions, has added new 26VDC components to its proven, dual-function TransFeed™ and TransFeed Automotive Series varistors, extending the series' superlative EMI/RFI filtering and bi-directional ESD protection capabilities to an even broader range of applications, including: automobiles, power supplies, computers, medical instruments, smartphones, multimedia add-on cards, barcode scanners, remote terminals, transceivers, and test equipment. TransFeed and Transfeed Automotive Series multilayer varistors (MLVs) are transient voltage suppression (TVS) devices that combine the most beneficial electrical characteristics of AVX's robust TransGuard® TVS devices with those of its proven feedthru capacitors in a unique 0805 single-chip solution that responds to transient events faster than any other TVS device available on today's market (<0.2ns), provides state-of-the-art overvoltage circuit protection and EMI attenuation over a much broader range of frequencies than comparable devices, and delivers significant EMI attenuation when in the off-state. 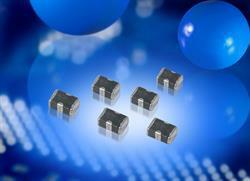 "General purpose TransFeed and TransFeed Automotive Series varistors both provide outstanding bi-directional ESD protection coupled with low parallel inductance, excellent decoupling capabilities for high di/dt environments, and significant noise reduction in digital circuits, which makes them an ideal choice for systems designers with transient voltage and broadband EMI/RFI concerns," said Jiri Machanicek, product manager at AVX. "Both series prove especially useful in fingerprint ID and magnetic field circuits, microcontroller and interface I/O lines, and power regulation and line conditioning applications, and the automotive series is also well-suited for use in drive-by-wire applications, dimming mirror circuits, and LCD dashboard drivers." TransFeed and TransFeed Automotive Series MLVs utilize a ZnO varistor material coupled with the electrode pattern of a feedthru capacitor to maximize the package advantage of the feedthru and the material advantages of the ZnO dielectric. This combination results in several electrical and physical advantages over standard ZnO MLVs, including: reduced parallel inductance, increased series inductance, faster turn-on time (<250ps), broadband EMI attenuation, multiple strike capabilities, and small size (relative to discrete MLV and EMI filter schemes). Measured response times for the two series range from 200 - 250pSec, which is less than half that of the fastest bipolar TVS solutions currently available, and both also exhibit excellent attenuation at high self-resonant frequency with a much flatter roll-off characteristic than comparable devices, resulting in EMI filtering over a much broader frequency spectrum. Rated for use in operating temperatures spanning -55ºC to +125ºC, TransFeed and TransFeed Automotive Series varistors are currently rated for 5.6VDC - 26VDC working voltage, 18V - 60V clamping voltage, 0.05J - 0.3J energy, 20A - 120A current, 500mA to 1A feedthru current, and 0.15Ω to 0.25Ω DC resistance. Both series are available in 0805 cases with Ni Barrier/100% Sn terminations, exhibit excellent solderability, and are shipped on tape and reel in quantities spanning 1,000 to 10,000. The TransFeed Automotive Series is qualified to AEC-Q200, and both the general purpose and automotive series MLVs are RoHS compliant. Lead-time for the series is 14 weeks. For more information about AVX's general purpose TransFeed Series MLVs, please visit http://www.avx.com/products/circuit-protection/transient-voltage-suppressors-varistors/transfeed-general-purpose/. For more information about AVX's TransFeed Automotive Series MLVs, please visit http://www.avx.com/products/circuit-protection/transient-voltage-suppressors-varistors/transfeed-automotive-series/. For all other inquiries, please visit www.avx.com, call 864-967-2150, or write to One AVX Boulevard, Fountain Inn, S.C. 29644.